The Cuzco play system is designed for older children, with floor heights of 140 cm and 190 cm. 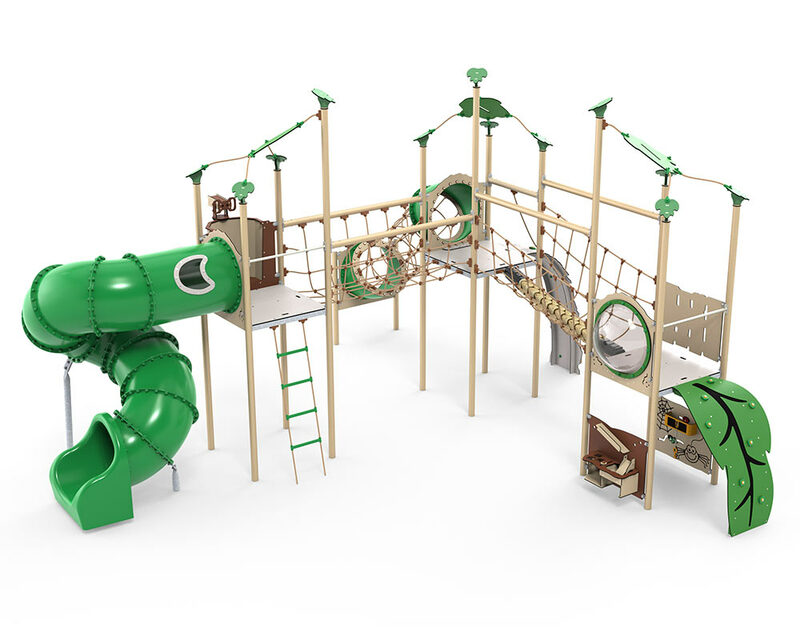 The system is very motorically challenging with many climbing and balancing activities. Only after a difficult climb up the curved climbing wall panels and across the rope tunnel is it possible to access the system’s highest tower. From here, the crow’s nest provides spectacular views across the entire playground. Then, from the upper tower, children can hurtle back to ground level down the tube slide, which will leave them reeling with excitement. Under one of Cuzco’s play towers, a space has been created for concentration and role-playing. Here, it is the Explore universe’s treasure chest with its key and diamond as well as the kitchen that set the scene for children’s play. All the small moving parts in the treasure chest and kitchen train children’s fine motor skills while stimulating their creative and cognitive development. Role-playing is important for child development, as it is here that they learn about social rules and how to compromise, negotiate and resolve conflicts.